Two women who fell victim to romance scammers have lost more than £100,000 between them. The Police Service of Northern Ireland highlighted the recent cases as they issued a warning about dating scams ahead of Valentine’s Day. The women, from counties Antrim and Down, reported losses to the police of almost £105,000 in the last two weeks. According to police statistics, in a nine-month period last year, 39 people reported as victims of dating scams in Northern Ireland, with losses totalling almost £220,000. Police fear the number of actual incidents is far higher, with many people who are duped reluctant to tell the authorities. 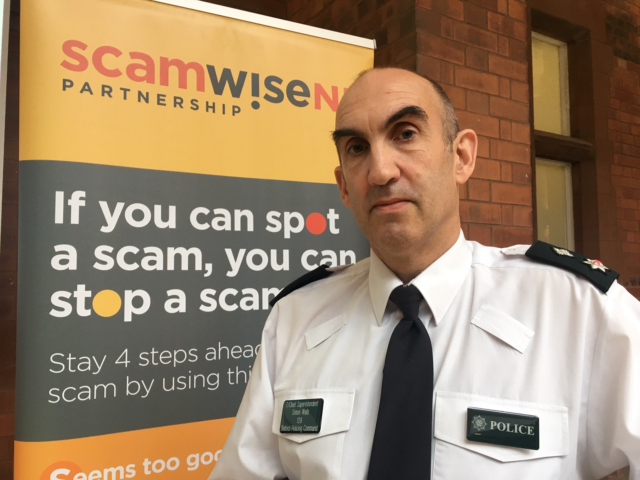 PSNI Chief Superintendent Simon Walls said: “Unfortunately, we continue to see members of the public lose very significant amounts of money in online and telephone scams. “Last year, between 1st January and 30th September, there were a total of 39 reports relating to dating scams in Northern Ireland when more than £218,000 was taken or scammed from people. “While these are alarming statistics we believe romance scams are significantly under-reported. “We think many people are simply too embarrassed to tell us they have been scammed in a romance fraud. In the first case, reported on February 4, a Co Antrim woman lost £65,000 to a man claiming to be in the US Army with whom she struck up an apparent online relationship. “The pair were in touch for around a month before things took a romantic turn,” said Mr Walls. “From May last year, the man told the woman a number of stories, including that he was being detained by authorities in Africa, in a bid to get her to give him money. “The woman believed the man’s stories, and was conned into sending him £65,000. In the second case, reported on February 10, a woman from North Down was befriended online by a man claiming to be a US engineer. “They had been in touch since November and the man eventually asked the woman for money for projects,” said Mr Walls. “She trusted the man and believed his story, and sent him payments totalling £40,000. “Sadly, for these two women they will not get their money back as they gave it to the fraudsters voluntarily. “These reports illustrate how scammers don’t care about their victims; that they’re happy to take advantage of people’s vulnerability and good faith. “Unfortunately, there is no end to the methods fraudsters will use to dupe people into giving them money. “Romance scammers don’t prey on a specific gender, sexuality, race or age. “They target everyone, just don’t let it be you. “Don’t let yourself become a statistic. Protect yourself if you want to use the internet in search of love or companionship. “Start off with a reputable website. Look out for someone asking lots of questions, but not giving any detail about themselves. “Don’t ever hand over any money or send goods such as iPhones or iPads. “Never let anyone you don’t know or trust transfer money into your bank account. “If you want to buy that something special for someone on Valentine’s Day, make sure you shop from reputable websites and that you keep your details safe. The officer encouraged anyone targeted by romance scams to report it to Action Fraud via their website www.actionfraud.police.uk or by phoning 0300 123 2040 or the police non-emergency number 101.